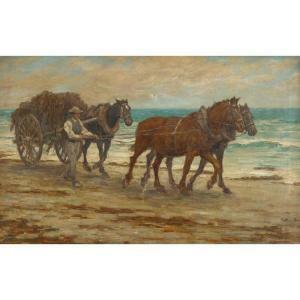 Find artworks, auction results, sale prices and pictures of Aloysius C. O Kelly at auctions worldwide. 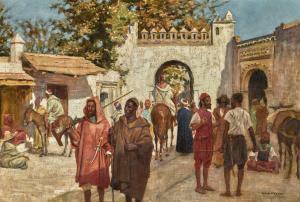 Aloysius O'Kelly PORTE DE LA CASERNE, TANGIER 1849 - 1926 signed l.r. :ALOYS.O'KELLY/ TANGIER oil on canvas 35 by 51cm., 13¾ by 20in. Private collection, 1997 Exhibited New Haven, Yale Center for British Art,America\’s Eye: Irish Paintings from the Collection of Brian P. Burns, 25 September 1997 - 4 January 1998 Catalogue Note Aloysius O'Kelly's paintings range in subject from scenes of Brittany - a popular artist colony; Irish rural life and Oriental views. Ireland produced very few Orientalist painters, and O'Kelly developed his interest while studying under the great Orientalist painterJean-Léon Gerome at the Ecole des Beaux-Arts in Paris in the mid-1870s. 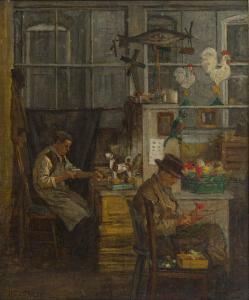 He produced a number of paintings in North Africa including Tangier and Cairo; while Lavery is the most obvious connection to O'Kelly in this capacity (see following lot), O'Kelly's greater focus on individuals and their way of life distinguishes his art. Aloysius O'Kelly 1853-1936 THE TOYMAKERS Oil on canvas, 24" x 20" (61 x 50.8 cm), signed. 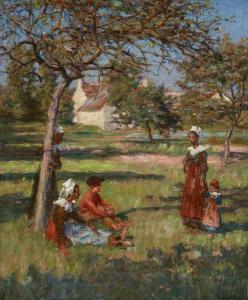 Provenance: Shannons Fine Art Auctioneers, USA, Oct 25 2007 (lot 102); Private Collection, Northern Ireland. Literature: Niamh O\’Sullivan, Aloysius O\’Kelly. Art, Nation, Empire, Field Day 2010, illus., catalogue no. 187. The painting is not relined and it is not restored. There is only mechanical damage, along with minor impressions from the stretcher bars verso. The mechanical damages are: in the sky, a c- shape tear approx. 3/8 x 1/2 inch, and at lower center, a tear approx. 1 3/4 inches long (with corresponding tape on the verso). At center right there are four small holes, roughly in a semi-circular pattern. At the tears, holes, there is visible canvas matrix and some associated paint loss. The painting appears to be in need of cleaning. Descriptions provided in both printed and on-line catalogue formats do not include condition reports. The absence of a condition statement does not imply that the lot is in perfect condition or completely free from wear and tear, imperfections or the effects of aging. Interested bidders are strongly encouraged to request a condition report on any lots upon which they intend to bid, prior to placing a bid. All transactions are governed by Freeman's Conditions of Sale. Good Samaritan Lutheran Church (est. 1917) served the large German immigrant population living on Blackwell's Island, later known as Welfare Island (from 1921 when it was used principally for hospitals) and ultimately Roosevelt Island from 1973. 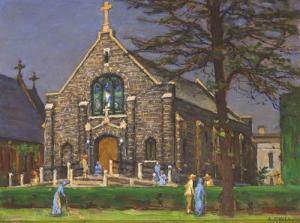 By the 1950s, most of the island's institutions had relocated or closed among them the Good Samaritan Lutheran church which was abandoned and ultimately demolished.